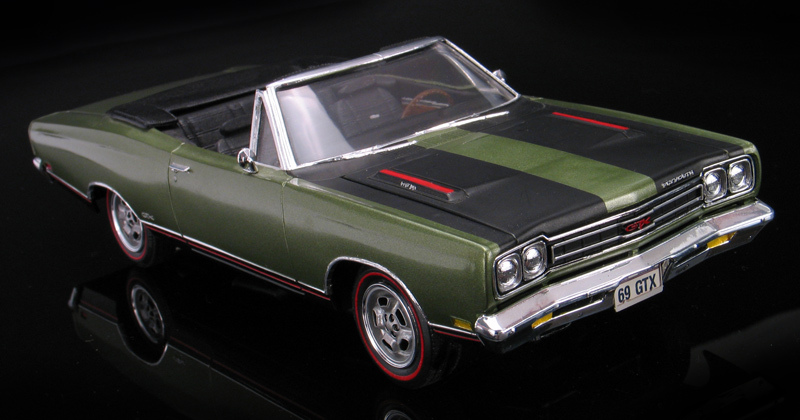 In 1969 Plymouth offered the 426 Hemi engine in both the Road Runner and the GTX versions of their B-Bodied Belevedere. The Road Runner was a stripped out base model with a taxi-cab interior made so young guys could get into a fast car for cheap. The GTX on the other hand was a more luxurious model made for executives who wanted a nicer car. The hi-performance 440 engine was the logical choice for most GTXs. It was fast and reliable and less temperamental then the Hemi. 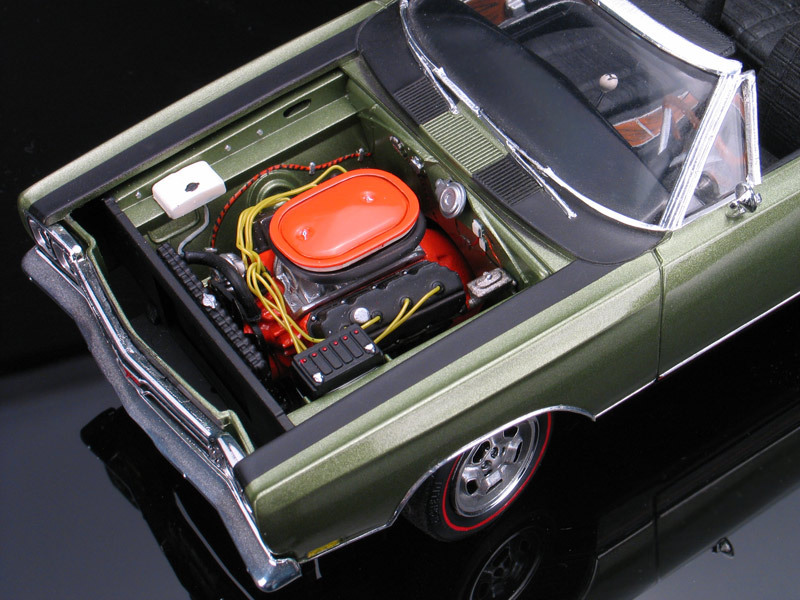 The 426 Hemi engine was really meant for drag racing, so it's uncommon that many Hemi motors actually made it into the GTX and even more rare that they would have made it into a convertible body. But you could order it from the factory that way if you wanted. Checking all the option boxes in '69 would have made this one of the most expensive Plymouths you could buy. 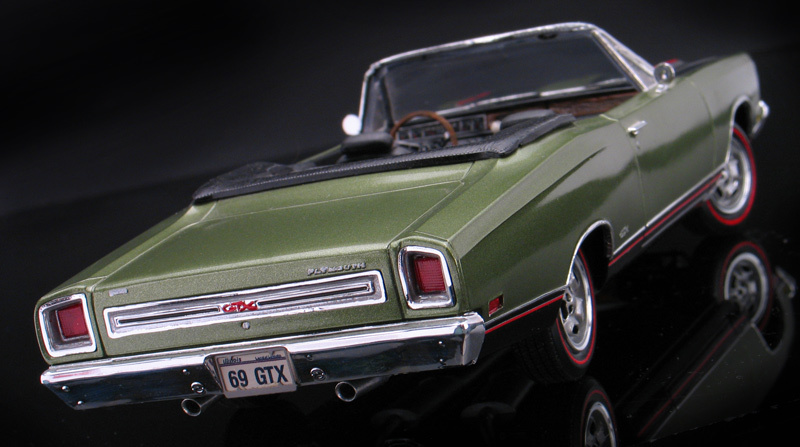 I built my '69 Plymouth GTX convertible to represent a fully loaded 426 Hemi car. Checking all the option boxes in '69 would have made this one of the most expensive Plymouths you could buy. 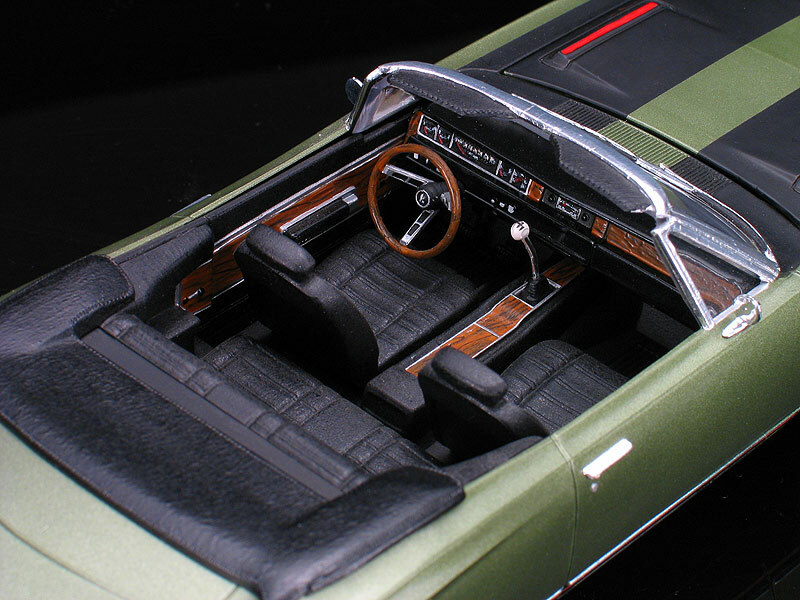 Using the AMT/Ertl '68 Plymouth Hemi GTX convertible kit i built mine pretty close to out of the box. I did change the wheels to the ultra rare factory cast aluminum wheels. These wheels came from the MPC '69 Barracuda kit. I also added hand painted the red line tires using a ruling compass and added wood grain interior panels. I also added exhaust tips made from real aluminum tubing. The license plate frame are photo-etched metal. Lastly, I added some engine wiring to the 426 Hemi engine. I generally, don't like wiring engines, but a Hemi just doesn't look right without at least the ignition wiring added so I made a humble attempt.